TheZeDD, if I may correct you, you should cool down a bit. Sarcasm is allright, when it comes from people that know where their towel is. Posting things about this specific topic - judging from the amount of misconceptions you showed in your post - may be a bit premature for you. Consequently ANY other method is OUT of the topic. If you have ANY second hand report abot this EXACT method (working or not working) this is NOT the place to discuss it. If you have ANY, first or second hand, report about ANY other method BUT the one we ARE talking about, AGAIN this is not the right place to discuss it. ONLY if you, yourself, tested this EXACT method and are wishing to report what happened describing FULLY and with the most DETAILS the hardware you tested it AND if it was UNsuccessful (likely) or successful (UNlikely), this would be the right place to post your report and your experience. Installing Windows 7 from pendrive is PERFECTLY possible, and there are several tutorials/apps about how to do it. Obviously we are all drooling at the idea of hotter water and rounder wheels, but we do know how known hot water ad common wheels are made. Ok, I follow you if you sort or followed me. What I got lost on was the fact you are doing something I was unfamiliar with for starters. But by the looks of it we still went back and forth on something not needed. I think we are talking at cross purposes here. The title of this topic is 'The mistery of Windows 7 install required CD/DVD'. 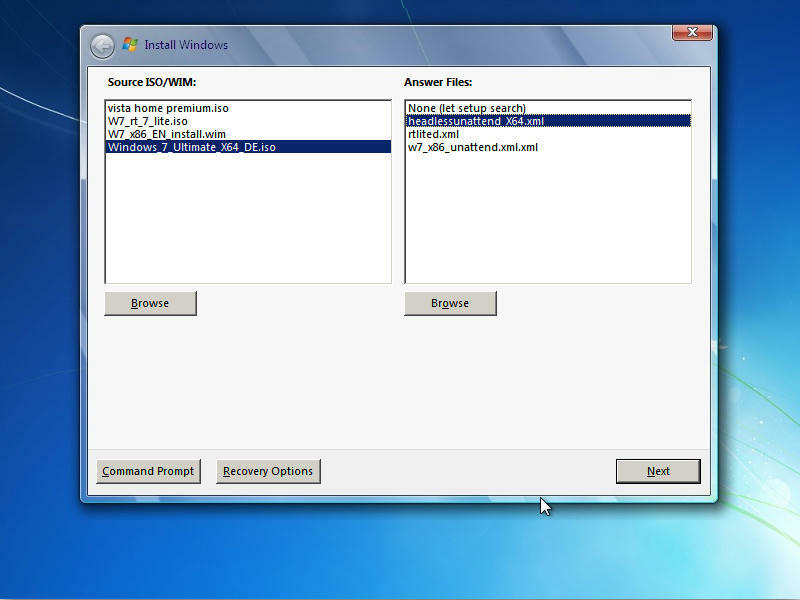 The topic is describing how to take a Windows 7 install DVD iso file and boot from a USB drive containing that iso file." I was under the impression, as by what I had posted, that you were trying to load Windows 7 from a UFD as well as Install Windows 7 to a hard drive booting from a UFD with an ISO of Win7. By the looks of it (withtou knowing or having the blessing of using whichever.wim) I would guess that is what you were talking about. My appologies for any confusion I was offering what I had referenced over many hours of attempting to compile something for, not just my benefit. Have anyone figured out yet how to have multiple windows7/2008/R2 etc ISOs on the same USB drive and be able to choose which one to install? Is it possible to modify each ISO and somehow change the default path to "sources" to let's say "sources1", "sources2" etc and place corresponding folders with extracted contents of each OS ISO on USB flash, hope it makes sense ? This is not from an ISO though, but if you really wanted you could make each folder into an ISO as long as the SOURCES\INSTALL.WIM was left on the USB drive.. Not really worth it in my opinion though. Is it any different from the one posted just two posts before? It is quite similar , but the poster is asking for the impossible (unless you have 4GB of RAM to load the whole ISO into or break in and load a virtual disk driver like ImDisk as in here ). Sure , what I was trying to indirectly point out is that everytime someone asks a question someone posts an answer that has ALREADY been given, we can continue indefinitely. The XP firadisk/winvblock works because grub4dos mounts the whole XP ISO in RAM and then Xp finds it as it has the RAM disk driver loaded into XP when it starts GUI Setup phase. With Win7, it is all GUI setup phase and in protected mode, so we would need to get ImDisk loaded into pmode. There may be a way... If you place AutoUnattend.xml on the USB drive, it will be loaded by WinPE Setup and used instead of the one in the ISO. There is a slight problem in that Vista had a bug and did not look at USB drives for this file, but this may be avoided if we use FiraDisk Floppy RAM drive to hold the same AutoUnattend.xml file because Vista will only look at floppy drives for this file http://support.microsoft.com/kb/933495 ). So if it picks up the autounattend.xml file, we can tell setup to run ImDisk (via a .cmd script) and point it at the Iso file on the USB drive. Setup may then continue and use the ISO sources\install.wim file for it's source payload file? Not sure though how to path it.. X: will be the mounted WinPE ram drive, but the drive letter of the USB drive may not always be the same??? There must be a way - like migrate.inf was for XP, to assign the drive letter. What would running USBDLM do? I am missing why firadisk or winvblock cannot be used like in the XP from ISO approach (of course in protected mode in this case). But it is not a problem about the actual driver used, but rather in the fact that it can be made to work without the need of the huge amount of RAM, one way or the other. I would say, that unlike the recent evolutions of the "install XP from .iso" it won't be possible to use a "vanilla" Windows 7 .iso, but I presume that if we are allowed to have a modified source .iso, it can be made to work, again one way or the other. 1. On 'office' system, mount Enterprise Win 7 SP1 64-bit ISO and copy bootmgr and \sources\boot.wim to USB flash drive. 4. 'Press a key to boot from CD' prompt -> Setup will run. I tried booting from the ISO directly via grub4dos, and then load ImDisk when Setup starts, but Setup says 'Setup was unable to create a system partition or locate an existing partition'. So the only issue is that we need two \sources\boot.wim's - one for x86 from a Win 7 x86 DVD, and one from amd64 from a Win7 64 bit DVD. We can use the trick of changing bootmgr to boot bcd or bcd1 using grub4dos write modify commands to make this work. So we boot to vanilla WinPE v3 (use WAIK to prepare one x86 and one amd64) - either x86 or amd64 depending on grub4dos menu choice. Thats it! Just tested this and it works . So we can have two simple .cmd file menus - one for x86 and one for amd64. The user chooses his OS ISO (Vista, Win7, SVR2K8, SVR2K8 R2) and away we go! Add more SKUs just by adding an ISO and adding an entry into the cmd script file. OK - new Tutorial added just for Wonko! Once created, you can add in any Vista/7/SVR2K8 ISO, edit a simple menu and it should all work! I'm using a single 'kickstarter' iso (~150-200 MiB) to start the setup and a GUI app to select the source (unmodified iso or wim). Had the same problem. It can be solved by swapping HDs with grub4dos. At first sight, the IMDISK control panel app seems like not really-really neeeded. Care to share this solution/workaround? Do you boot to an 32-bit or 64 bit kicker ISO? And how can you run either 32-bit and 64-bit Win 7 ISOs? I'm using a 32-bit kicker. It's a modified version of a original 32-bit W7 install DVD. Everything from the /source folder is removed except the boot.wim and some files are added (ImDisk etc.). ImDisk mounts the ISO as drive z: and then I start z:\sources\setup.exe. This seems to work for x64 sources as well, but I only have a customized x64 source at the moment so this needs more testing. Windows remembers INT13 drive numbers and associated MBR signatures and MBR checksums during startup. This information is saved in registry key HKEY_LOCAL_MACHINE\HARDWARE\DESCRIPTION\System\MultifunctionAdapter. If there are more than one active partitions (on different disks), setup will install bootmgr and Boot\ in drive (0x80)'s active partition. May somehow be of help in refining the method. Is it available on the Shift+F10? thanks for your brilliant tutorial. my bootmgr is 383.786 byte. I have WAIK for win7 installed, not sp1, but italian version. where I may find a so big bootmgr? Is it maybe needed the waik english version? I am not sure. You can try yours and see what happens. Mine is dated 13/07/2009 and is from Win 7 Waik in download link I gave??? I've installed also the WAIK english version. same result (the bootmgr is always 375 kb). no more the previous error, but another one regardin digital singature of driver. I've tried testsigning no with bcdedit, with no success because the error displays again. Are you using my bc1 and bc2 files in \boot folder? These have been modified. My CRC32 is EE471B58 for my version of bootmgr. See Tutorial #31 again which I have just modified to include all versions of bootmgr patches (but I have only tested Win7 and Vista ones!). The first line (0x105E) prevents the 'corruption' message, so if you have even the slightly wrong version you will get the corruption message. ok, using a win7 sp0 bootmgr (EE471B58) and the new lines as in your #31 now it works fine! I've not tried to complete the setup, will do it tomorrow. thanks a lot! very good job!